There are several sources of inspirations for this ritual. Firstly I was asked to put together a ritual involving the Morrigan for the Spring Equinox. It is one of those seasonal rituals I decided not to put into Celtic Lore and Spellcraft of the Dark Goddess, and is often requested. Then not long after I was asked to lead a ritual to claim sovereignty. The ritual wasn’t at first intended to have anything to do with the Equinox but the timing of the event worked out that the two themes became intertwined. For myself the Spring Equinox is both a time of balance and renewal. It’s that time of perfect balance between night and day, when we are just a step away from spring and the sweetness of summer to come. In my own practices it is also a time to encourage the building energy of growth. A time to offer a blessing to the land, as it is the source of our own sustenance. In the past I would leave bird seed and other offering to help the wild life get through that last bit of winter. In Connecticut, as I am reminded of with yesterday’s snow storm, there is still often snow on the ground, despite the scent of spring is in the air. Spring isn’t always so apparent this time of year, at least not where I live. It needs a bit of a helping hand. This fit nicely with the concept of sovereignty. In Celtic myth kings gained sovereignty by ritually wedding the goddess of the land. Essentially the two became one and the same. What happens to one befalls the other. When Nuada the king of the Tuatha Dé Danann’s hand is cut off in battle he is no longer allowed to be king, for his blemish will be translated to the land. So this ritual is both about connecting to the land that gives us life and taking up our own inner sovereignty. To align with our truest Will and take up power within our lives. Since the Morrigan Devotional Ritual at PantheaCon the four treasures of the Tuatha Dé Danann have been on my mind. 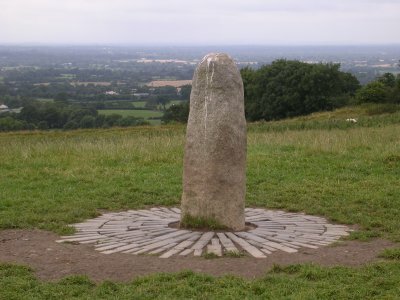 And I can think of no better way to connect both to the land and our own sovereignty than working with the Lia Fái, the stone of destiny that cries out for the true sovereign. If you do not have one of the items to represent one of the four treasures a picture of a sword/spear etc can be used in its place. Great Queen come now to us! Beneath the peaceful heavens lies the land. Resting beneath the bowl of the bright sky. There it lies, the splendor of the land. The land is like a mead worth the brewing, worth the drinking. It stores for us the gifts of summer even in winter. May it be blessed nine times eternal! Place the torc (or whatever you are using as a symbol of sovereignty) on the stone. If working in a group, place each participants item around the stone or have the items touching the stone in some way. May my work be to my benefit and others! Spend a few moments sending healing loving energy into the land that sustains us and into the world that we live in. Thank the Morrigan and close the circle in whatever manner you wish. Leave an offering outside to both the Morrigan and the land. Bird seed or some other offering that would benefit the land around you would be appropriate.